Downton’s Offensive Line is Ready! Christmas is on our doorstep—and so are the Buffalo Bills. End of the season’s greetings are in order. At long last the end of the NFL season can be celebrated with spiked eggnog and a spiked touchdown from Gronk. It’s that time of the year when all Patriots fans are singing “God Rest Ye Merry Gentlemen.” This annual favorite actually is a cry to Bill Belichick to rest his team for the playoffs. They seem to forget that the Patriots are already the proud winners of a bye-week in the first round. There will be no round young virgins to beat up as the playoffs start. With home field advantage, we know that the refrain, “Let it snow, let it snow, let it snow,” will give Tom Brady his usual advantage against warm weather, indoor teams. We await the toe-to-toe matchup of Julian Edelman and Gronk under the mistletoe. It can’t be any more embarrassing than a header with SWAG champ Justin Bieber. The Three Wise Men of Defense (Wilfork, Chandler Jones, and Rob Ninkovich) will bring gifts of myrrh to Bill Belichick. In case you forgot at this busy shopping season, myrrh is hard to find, but it is essential if you want to perfume bad games, incense your enemy, or need a balm for your aching muscles. And, you thought resin was only used in baseball. 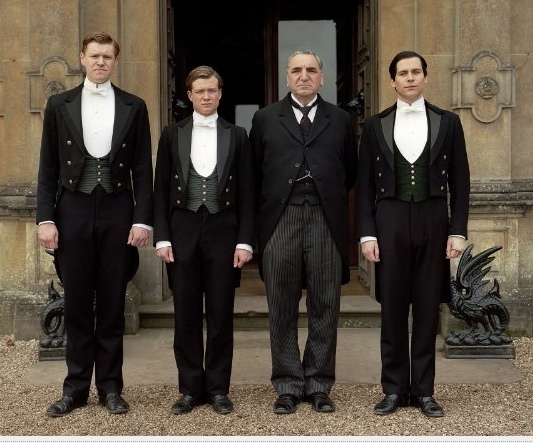 The biggest problem facing knowledgeable fans of a certain stripe is the Downton Abbey issue. Starting in January, the prestigious British series returns on Sundays to go head to head with NFL thugs. The choice of tuning in to the upper crust or the bottom feeders will become a great debate among intelligentsia.